Old map by BRITISH ADMIRALTY CHART. 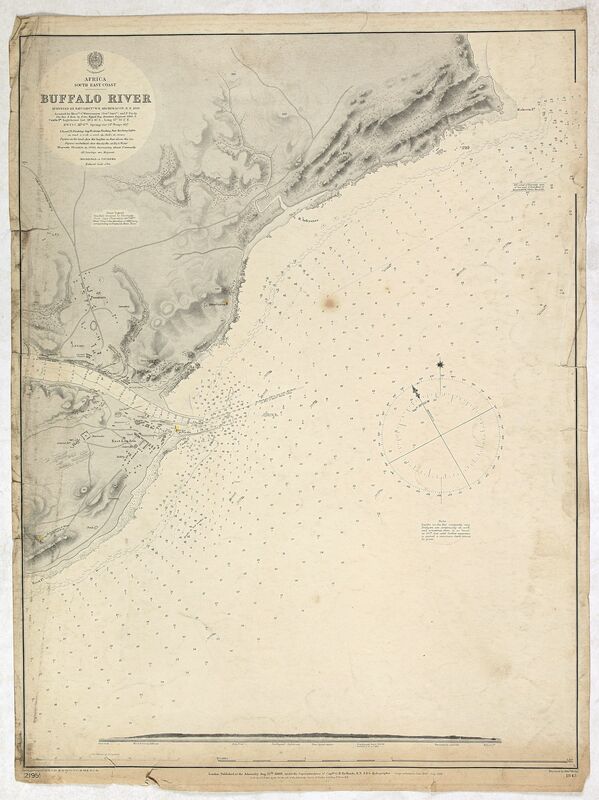 - Africa east coast Buffalo River… Surveyed by Nav.g Lieut.t W. E. Archdeacon, R.N., 1868. . . Title: Africa east coast Buffalo River… Surveyed by Nav.g Lieut.t W. E. Archdeacon, R.N., 1868. . . Size: 25.6 x 19.3 inches. A fine Hydrographic Office chart no. 1843 (2195) figuring the coast with Dar es Salaam and the Island of Zanzibar. Engraved by Edw.d Weller. London : Published at the Admiralty Aug. 12th 1869 under the Superintendence of Captn. G. H. Richards, R.N. Hydrographer : Sold by J.D. Potter agent for the Admiralty charts, 31 Poultry & 11 King Street, Tower Hill". Full title : "Africa east coast Buffalo River… Surveyed by Nav.g Lieut.t W. E. Archdeacon, R.N., 1868.... Magnetic variation in 1900, decreasing about 2' annually".